You want feedback about your app so you know what is working and what is not. You may also want the users to rate your app. 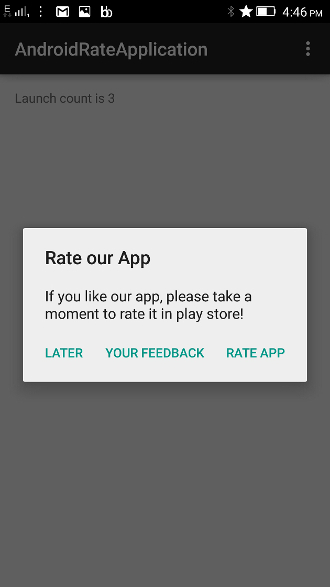 In this article, we will show you how to create a ‘Rate our App’ dialog that lets them either rate or give you a feedback. Rate App – On selecting this, user will be taken to app’s listing in the user’s Google Play store. Feedback – This is useful if the user is not happy with your app and would like to give you some feedback instead of opting for a negative review in app store. Later – This is useful in case user wants to rate it some other time. Ok, now we know what choices we want to show in the Rate our App’ dialog but about the ‘when’ part, when should we show it? User can rate your app only when the app has been tried few times which means we need to keep track of the launch count. We can either hard code the launch count or provide a setting which allows them to decide when they are ready to rate. In this example, we have hard coded the launch count to 3. The main layout shows the launch count (for the sake of example) so we know when the dialog will show up. We will store the launch count in shared preferences. Whenever user launches the app, we will increment the launch count. If the launch count is 3, we will create the ‘Rate our App’ dialog and show. Positive – Rate app in play store. Intent.ACTION_VIEW is the intent action you will use if you want to display some data to the user. Based on the context, it will know what to display. Negative – Open activity to send feedback. This is taken care by the special intent Intent.ACTION_SEND. Neutral – Postpone rating. This should reset the launch count. 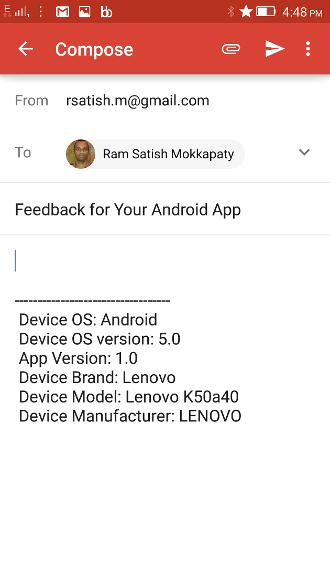 For opening the feedback dialog, we will rely on Android’s inbuilt mechanism, another special intent Intent.ACTION_SEND which is used when we want to send information to another activity. 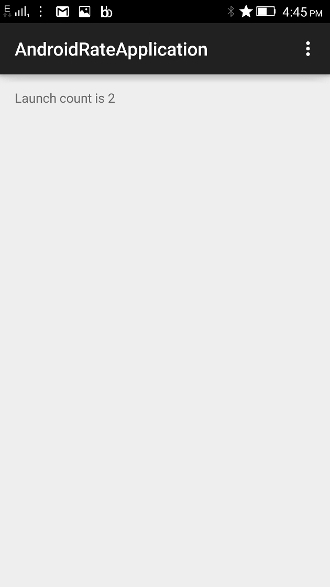 The intent’s type message/rfc822 indicates that we want to send email. 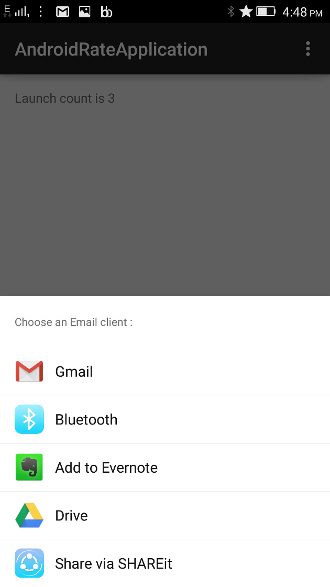 Android will display all the installed applications with a filter that matches ACTION_SEND and intent type. If more than one application matches, the system displays a disambiguation dialog (a “chooser”) that allows the user to choose an app. We have called Intent.createChooser() to pass our SEND intent. This is to make sure that a chooser is displayed even if the user has previously selected a default action for this intent. Here is preferences class to track the launch count and store the info of whether the app is already rated. This was an example about displaying ‘Rate our App’ dialog in Android.